In other owlet news, I've decided to put my market career on hold for now... perhaps for a long while. Yesterday I withdrew from the Autumn Market I had planned to have a stall at. I won't be at the Christmas one either, and that feels ok. I do so love meeting people and chatting to them. Getting personal feedback on the things I've made. But there's so much preparation involved... so many nights spent at the machine or weekends spent cutting and labeling and having everything just so. And really I should be spending time making stuff for them. My owlets. And sometimes me. So I'll be popping bits and pieces in my shop from time to time and you can always drop me a line and ask if I'll whip up something for you if you see something you like. But it may take a little while and it may not be often... because I'm knee deep in owlet cuddles and giggles and making the most of every minute, while I can. You're already famous to me my dear, but that is a wee bit of a thrill! Oh my goodness!! That is totally famous!! Wow, timely post. I have been thinking the exact same thing recently. Exact! Cngrats on the magazine pic, how wonderful for you! 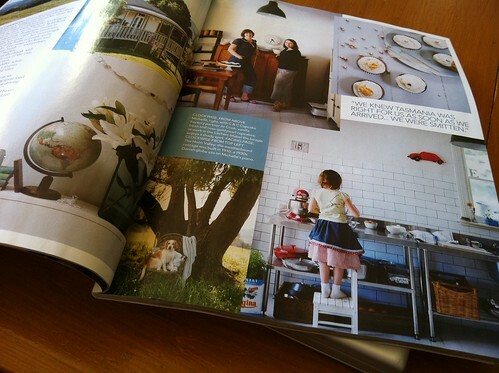 wonderful to see your handiwork in such a lovely mag too! I still get comments when my little one wear's hers..she insists on wearing it, even though it doesn't really fit her anymore. understand about the market thing ~ market prep is exhausting.